Location: 35 km from district headquarter Hajipur. Near Abhishek Pushkarini. Importance: Established is 1971 by Govt. of India. The exhibits in the museum consist of antiquities, terracotas, seals & sealings, beads of semi-precious stones, punch-mark & cast coins, pins & styli of bone, terracotta & ceramic specimens. 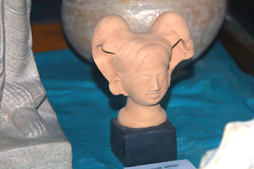 Dates ranging from Maurya (4th BC – 2nd century AD) to Gupta (4th BC – 6th Century AD) & few sculptures of Pal period (8th AD– 12th century AD) are the main attraction. All archaeological remains & their surroundings collected - in surface findings & archaeological excavations in Vaishali. Location: In the district headquarter Hajipur, in the middle of the town, at Gandhi Ashram. 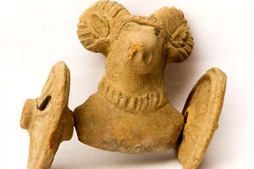 Imporance: Established in 1979, by the Directorate of Archaeology & Museum, Bihar. Among the important collections, are a stone fragment of Gupta period (4th AD– 6th Century AD), a terracotta, medieval arms, replicas of Indian coins ranging in date from Maurya (4th BC- 2nd Century AD) to the medieval period (10th AD– 17th century AD) diaries (of late Deep Narayan Singh, activist & Chief Minister of Bihar), and valuable blow-ups of local freedom fighters. The museum is in the process of being organized. Location: 18 Km. from district headquarter Hajipur. Situated on the banks of river Ganga & Gandak. 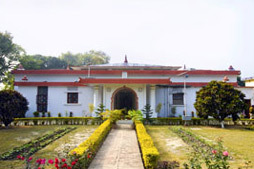 Importance: Some very important archaeological remains of Neolithic age, pre Buddhist period, Buddhist period, Maurya period, Gupta period, Kushan period, Pal period & Middle age - found due to excavation or erosion by the river Ganga preserved in this private Museum. This rare collection only goes to - 35 years search of Sri Rampukar Singh, an activist & great archaeologist and two excavation in 1978 & 1989 – this internationally important tourist site is the only place on earth which reflects the development of 'Aryan civilization' in the 24 village complex of chechar. 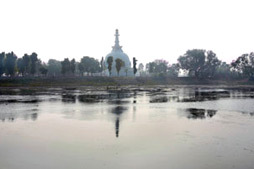 Present Level Antiquities are found due to erosion by the Ganga Chechar Complex comprises of about 2 dozen villages.In almost every village, Buddhist Stupa and remains of ancient times exist. (12-17 A.D.) Remains of Houses built of bricks of Muslim period, coins, old tombs, earthenwares. Toms at Kutubpur. Old brick-walls, earthenwares found in 1978 excavations. Arch, remains of middle ages extant in Daudnagar near Biddupur. (8-12 A.D.) Black Basalt rockimages of Lord Buddha, Lord Mahavira and of other gods and godesses. Huge Shiva Lingam are found in abundance in almost all the Chechar-village complex. Kutubpur, Chechar, Biddupur etc. (4-6 A.D.) Copper and Silver coins, earthenwares, remains of house-sites, terracotta, Buddha Stupa, Inscribed Seals, Bone plaque of female carrying lyre. Chechar, Kutubpur excavation and even present at groud level. (4 B.C.-2 A.D.) Punchmarked and cast coins of copper and silver, Inscribed Seals, Terracotta of different types. Black stone idols, wares and potteries remains of brick-built houses, household-hearths, Buddhist Stupa, Selucus's daughter Helena's terracotta. Checharand and Kutubpur excavation of 1989 & groud level. (15-17 B.C.) Instruments made of copper and horns of Deer, Stones, Black/Red earthenwares , Copper Arrow-head(16 cms long)-longest arrow-head found till date in the world. Checharand and Kutubpur excavation, 1978. (18-25 B.C.) Instruments made of bones, stones and deer horns in abundance Checharand and Kutubpur excavation, 1978. 35 km. from district headquarter Hajipur. Location: In the middle of Vishwa Shanti Stupa & Asthi-Kalash Asthal at Vaishali. Importance: Abhishek Pushkarni is also known as ‘Kharauna Pakhar’. It is believed that before coronation of Lichhavi's (6 century BC – 5 century AD) kings had to be first 'anointed before being crowned', with the sacred water of this holy tank. Location: 35 Km from district headquarter Hazipur. At Basadh village, Vaishali Sadar, Vaishali. 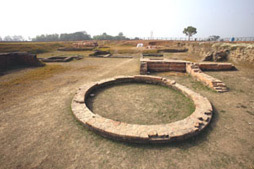 Importance: The excavated site ‘Raga Vishal Ka Garh’, a huge mount, with a circumference of 1.5 km. – was once the ‘ancient parliament house’ of Vajji's Republic (6th century BC) – the world’s first Republic with a duly elected assembly of representatives and efficient administration. In this big parliament house 7707 representatives can sit together at one time. Now it looks like ‘ruins of a fort’. Walls of the Garh are 2 meter high. On the boundary of garh, we can see 43 meter deep ditch. Many archaeological remains like teracotta, ancient pots coins etc.,were found from this site.